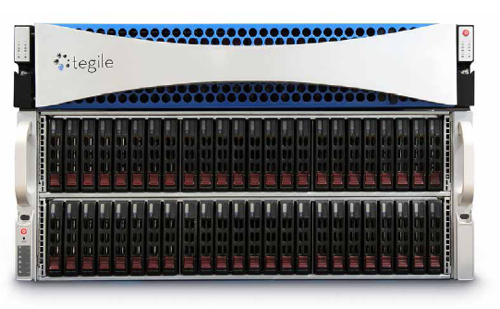 Hybrid array start-up Tegile has come out with a T3000 product twinset; a high-end flash/disk hybrid and an all-flash array, equipping it to compete with both hybrid and all-flash array products. It’s done this by upgrading the controller processors from four 4-core Xeon E5620s to four 8-core Xeon E5-2450s. This is a serious amount of controller horsepower but then the controller mills grind out deduplication, snapshots, thin replication, thin provisioning, VM-aware management features and application profiles. We have got used to hybrid arrays from startups like Nimble Storage, Tegile and Tintri offering near-all-flash array performance - think Pure Storage, etc. - combined with disk array capacities. All-flash arrays offer a performance high ground a step above the hybrids. Tegile aims to put a stop to that with all-flash configurations of its arrays. The previous high-end array was the HA2800, with a 4.4TB to 148.4TB raw capacity range. The two new top-end products are the hybrid T3400 and the all-flash T3800. They come in a 2U enclosure and can each have two 2U expansion enclosures having either 24TB or 72TB of disk (1TB drives) or 72 x 2TB SSDs. The T3400 can have 26TB of flash (13 x SanDisk 2TB SSDs) plus it has a separate 2.2TB (11 x HGST 200GB SSDs) used for metadata acceleration. Then it can have up to 144TB of disk added via the expansion trays or up to 288TB of additional flash via the expansion trays. Alternatively it could expand via a disk tray and a flash tray. The disks are HGST 1TB units rotating at 7,200rpm. The T3800 starts with 48TB of flash, using 2TB SanDisk SSDs, and it can scale up to 336TB, again via 2 x 144TB of flash expansion trays. Intermediate capacity levels are possible with 24-drive expansion trays. Both systems have a dozen 1GbitE ports and can support block - iSCSI and Fibre Channel - and file - NFS, CIFS, SMB 3.0 - access. Marketing head Rob Commins says the T3400 has an effective capacity of 1PB, assuming a 5:1 dedupe+compression ratio, whereas the T3800 has a 1.68PB effective capacity. We calculate an all-flash T3400 would have 340TB of raw capacity, meaning an effective 1.6PB at the 5:1 data reduction ratio. We think both the T3400, in all-flash guise, and T3800 should perform at roughly the same level. The flash used by Tegile, and the way it uses it, means, the company claims, that it can sustain its performance for many years. It says its SSDs have a 10PB (data written) endurance. The T3000 arrays have a 7-year warranty. At a 5:1 data reduction ratio the T3800 is said to have a street price of $1/GB; that’s effective gigabytes, raw GB after data reduction. The implied price for a 1.68PB T3800 on that basis is $1.68 million. It’s cheaper than an equivalently performing disk drive array. The all-flash FA-450 from Pure Storage, with 250TB of usable flash, is $800,000 - $900,000. A T3800 with 250TB effective capacity would cost, using the $1/GB street price number, $250,000. That seems a startling difference. Perhap’s Pure’s idea of usable capacity, which includes “all overhead (RAID, HA, FlashCare Reserve), and … the value of data reduction at typical rates” differs from Tegile’s effective capacity notion. They T3000s are intended for use in database, virtual server and virtual desktop environments. The hardware has a no-single-point-of-failure design. An inclusive license includes all the software available. Customers can also pay for the systems through a so-called Agility Pricing Program, paying for the data space utilised with pricing being as low as 20.6 cents/GB/month.